Associated Press/Virginia Mayo; Nicolas Asfouri – Pool/GettyA composite image of the Saudi journalist Jamal Khashoggi and Saudi Crown Prince Mohammed bin Salman. President Donald Trump on Tuesday issued a frantic proclamation saying the US would stand by Saudi Arabia, despite the possibility that the de facto Saudi leader ordered the killing. Despite leaks indicating that Turkey has a ton of damning information linking the Saudi crown prince to Khashoggi’s killing, Turkey hasn’t moved to publicly blame him by name. The news, citing unnamed sources and published to Turkey’s Hurriyet news website, comes shortly after President Donald Trump on Tuesday issued a frantic proclamation saying the US would stand by Saudi Arabia despite the possibility that Crown Prince Mohammed ordered Khashoggi’s killing. Anonymous Turkish officials have continually released information from Turkey’s ongoing Khashoggi investigation at a slow, steady pace with increasingly grisly and damning details. But while many previous reports linked the Saudi crown prince and de facto Saudi leader to Khashoggi’s death, the latest news purports to expose the US as spying on its ally, specifically the Saudi royals, and ignoring potentially consequential evidence of a murder plot. Abdulkadir Selvi, a columnist for Hurriyet, cited anonymous officials on Thursday as saying the CIA had a tape of Crown Prince Mohammed telling his brother Khaled bin Salman, Saudi Arabia’s ambassador to the US, that Khashoggi needed to be silenced immediately. Turkish President Recep Tayyip Erdogan has purged the military, press, and intelligence services of any critics, stripping them of their independence. That means news published by the Turkish media is thought to reflect news the Turkish government wishes to emerge. Experts previously told Business Insider that Turkish leaks could be seen as an intelligence or information warfare campaign from the Turkish government, aimed at forcing the US to reconsider its ties to Saudi Arabia. The Trump administration sanctioned Saudi nationals in response to Khashoggi’s killing and cut support for the kingdom’s war in Yemen. But Trump refused to outright blame Crown Prince Mohammed for the killing, saying it wasn’t in US interests to publicly break with the 33-year-old monarch set to rule the US-allied kingdom for the next four or five decades. 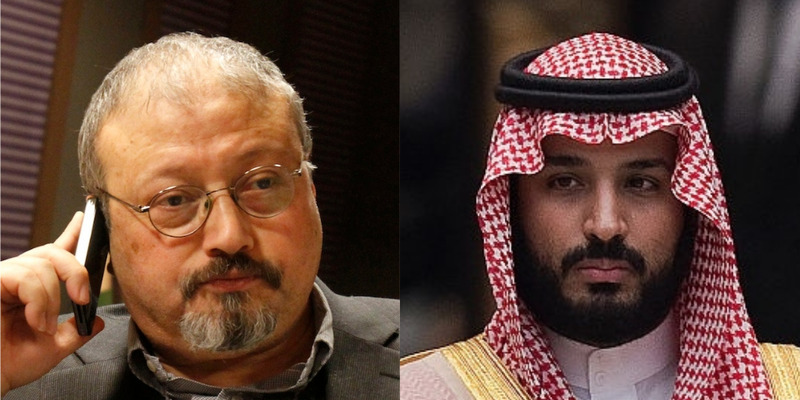 Importantly, though Turkish intelligence and even Erdogan have several times implicated the Saudi crown prince in Khashoggi’s October 2 killing at the Saudi Consulate in Istanbul, Ankara has not directly blamed him. In fact, no country has come out against Crown Prince Mohammed by name. But consistent leaks from Turkish media, which Erdogan has almost total control over after making his country the top jailer of journalists, have done incredible public-relations harm to the kingdom and to US support for it. By leaking an accusation that the CIA has been spying on Saudi Arabia, and calling for an international investigation to reveal more presumably classified CIA surveillance, the Turkish intelligence, media, and government have neatly aligned in what seems to be another move designed to keep pressure on the US.